Trading restrictions apply under the liquor legislation on Good Friday and Anzac Day. Licensees should check their licence and any extended trading permit. The permitted trading hours on Good Friday and Anzac Day 2019 are generally as follows (unless specifically approved otherwise). 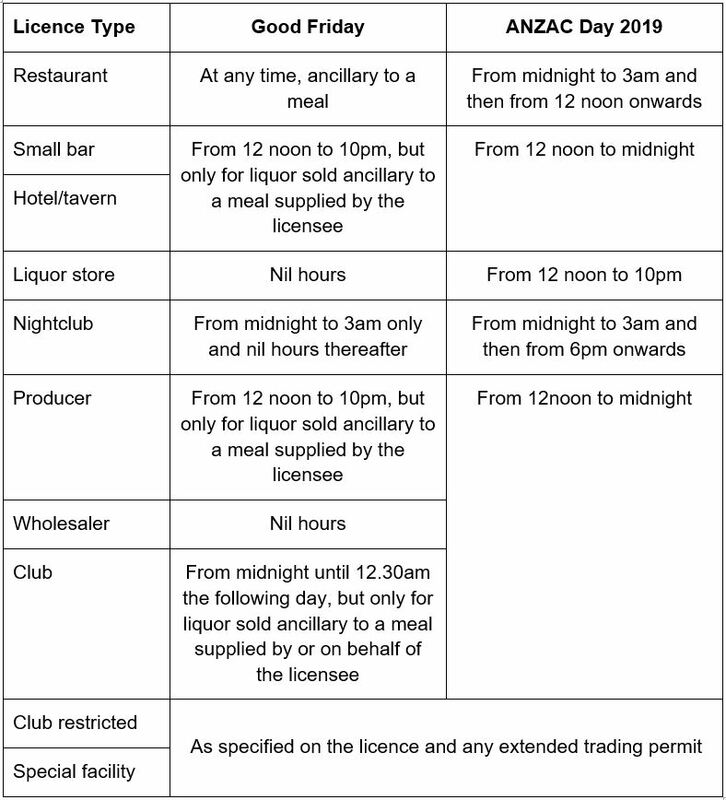 As prompted in our previous edition of The Hospitality Messenger, licensees should apply to the licensing authority as soon as possible for a one-off extended trading permit, or variation to their licence, if trading on either or both of these days is desired. There are certain lodgement deadlines by which such an application must be made. Extended or varied trading approval is subject to the discretion of the licensing authority. Generally for additional hours to be approved on Good Friday and Anzac Day, special extraordinary circumstances need to be shown.